There are some experiences in this life that you simply cannot put a price tag on. Chimp and gorilla tracking is, by far, one of those. Unlike anything you will ever see or do, witnesses these great creatures interacting with one another in their natural habitat is a moving, if not life-changing, experience. Our newest package to Africa, “Ultimate Uganda and Rwanda”, gets you up close and personal with the apes as well as a plethora of other wildlife in the lush, green tropical paradises of Uganda and Rwanda. Stay in the region’s most luxurious lodges in 4 National Parks: Kibale Forest National Park, Queen Elizabeth National Park and Bwindi Impenetrable Forest in Uganda and Volcanoes National Park in Rwanda. Polish it off with delicious food and attentive staff, this package’s true value is the everlasting memories you will relive for years to come. Welcome to Uganda! Upon arrival at Entebbe international airport - Uganda, Adventure Consults’ airport staff will meet you right on tarmac before entering the airport building. Staff will assist you through customs, retrieving luggage and will provide your transfer to the hotel. Depending on arrival time, you may have a briefing on your safari today/tonight or opt to have it in the morning after some hours of relaxation. After breakfast, transfer the airport, proceed through to the domestic check-in point for your bush flight to Kasese airstrip (flight departs Entebbe at 07:00am & 12:30 PM, Check in time - one hour in advance). Note that flight schedules are subject to change at short notice). Depending on arrival time and space availability on the domestic flights, we may either opt for a morning or afternoon flight). Adventure Consults’ guide will be at the airstrip, a welcome cup of coffee or chilled drink awaits then proceed to Fort Portal driving through the shadow of the fabled "Mountains of the Moon." Head out to Kibale forest driving through farmlands and homesteads. Lunch at the lodge. In the afternoon, you have an option to take a bird-walk around the lodge right in the middle of the ever green Kibale forest. *Prefer driving to flying? You have the option! Should you prefer, after breakfast you will head toward Fort Portal, driving through the evergreen tea plantations and forests. Located in the shadow of the fabled "Mountains of the Moon" is Fort portal town, where you will have a warm African lunch. In the afternoon, proceed to Kibale forest driving through farmlands and homesteads. In the afternoon, you have an option to take a bird-walk around the lodge right in the middle of the evergreen Kibale forest. Set against the stunning backdrop of Lake Kyaninga and the Rwenzori Mountains beyond, Kyaninga Lodge is the spectacular result of one man’s vision and six years of unwavering commitment to creating an experience of Africa’s beauty unlike anything else. You can experience the beauty and romance of this unexplored region, while staying in the height of luxury and elegance. Nine exclusive cottages made from hand carved logs, superb dining, and a wealth of adventures await. The edge of a spectacular crater lake provides the perfect start to your exploration of this hidden region. Stepping out from your cottage, your adventure begins here. Kyaninga Lodge’s beautiful gardens are the creation of London-based landscape designer Imogen Jenkins. The gardens provide a stunning setting for relaxation, reflection, and space for games. There is even a lawn tennis court for you to enjoy. With amazing wildlife on your doorstep, take a guided walk around the beautiful Kyaninga Crater Lake and Forest. See how many species of primate you can spot. After Breakfast, get ready to embark on a truly exciting adventure. Today, with expert guides, you will experience Chimpanzee tracking! Transfer to Kanyanchu Park Headquarters in time for a briefing and head out to the forest. Chimpanzee tracking starts early in the morning, and lasts about 3 hours. Kibale Forest is a host to 13 primate species. The guide will provide detailed explanations on not only primates, but also on all the forest's fauna and flora, ensuring that your walk is both informative and enjoyable. This walk is excellent for viewing bird life and primates in close quarters. After lunch, go for a walk in Bigodi - an eco-tourism swamp where rare and beautiful nature surrounds. This evening is yours to relax at the lodge after a long and unforgettable day. Enjoy reminiscing over a relaxing dinner. This morning after breakfast and checkout, you will start for Queen Elizabeth National Park, following the mystical Rwenzori Mountain Range most of the journey. Stop to explore the fascinating Katwe Crater area before heading to your new lodge for lunch. Have a quick look around the property before starting on your afternoon game drive! Keep your eyes peeled for game including waterbucks, elephants, leopards, buffalo, hyenas and a variety of antelope species. Enjoy a sundowner in the savannah and return to the Lodge for dinner. Option to go for Â a night game drive. To the east, lie the guardians of the birthplace of mankind, the Great Rift Valley hills, separated from the Mountains of the Moon by the meandering Kazinga Channel. Here the water flows endlessly into two giant lakes: Lake George and Lake Edward. Enjoy a cocktail in the Infinity Swimming Pool overlooking the Kazinga Channel. The pool at Mweya Safari Lodge has a panoramic view of the Kazinga Channel, which separates Lake George and Lake Edward. You can peer across the channel and identify the different wild animals cooling off in the waters below. Or, relax at the Tembo Bar with its panoramic view over looking the Kazinga channel and Lake Edward. Enjoy the shimmering sunset over the lake, whilst drinking a wonderful sundowner. The bar verandahs are a perfect place to relax after a day out in the national park. For those guests seeking the ultimate in privacy and exclusivity, Mweya Safari Lodge offers numerous configurations of cottages to suit your needs and requirements. Families may be more comfortable in our affordable, family cottages, namely The Rwenzori Cottage and The Royal Cottage. For those demanding something more luxurious and exclusive, the Queens Cottage and The Presidential Cottage will be sure to meet your demands. After an early rise and a cup of your favorite beverage, embark on a morning game drive along Kasenyi track and Queens’s mile in the expansive park. Keep a look out for lions, elephants, Cape buffalo, warthogs, leopards, hyena, mongoose, waterbucks, Ugandan Kob, and a plethora of many small animals and birds. After lunch, enjoy a unique boat cruise on the Kazinga Channel and into Lake Edward. This trip passes through high concentrations of hippos and more animals may be seen drinking at the water's edge. This river cruise offers an excellent platform for photography, bird watching and game viewing. The prolific bird life is colorful and stupendous with well over 600 spotted and recorded species. After breakfast and a final goodbye to Mweya Lodge, start for Bwindi via the Ishasha sector of the Queen Elizabeth National Park. On a beautiful, nearly 4 hour journey, you will be driven through Ishasha, famous for its multitude of animals, most notably its tree climbing lions which are unique to this region. Upon arrival to Bwindi Lodge this afternoon, take some time to relax around the camp or go on a village walk around Buhoma. Visit craft shops, local schools, and a hospital before settling down to enjoy some entertainment by the local community/Orphan group. Head back to the lodge for dinner. *Option to upgrade to Sanctuary Gorilla Forest Camp available upon request and upon availability. During 2017 the lodge was progressively renovated and all areas have fully reopened in January 2018. The luxury forest lodge in Bwindi now features a redesigned guest lounge and dining area, that bring the feel of the forest into the stylish interiors. The main living area has a central fireplace which acts as a focal point for guests to relax and discuss their gorilla tracking experience. A newly designed outdoor terrace gives dramatic views of the impenetrable forest and is a great place to spot the monkeys and birds hidden in the foliage. 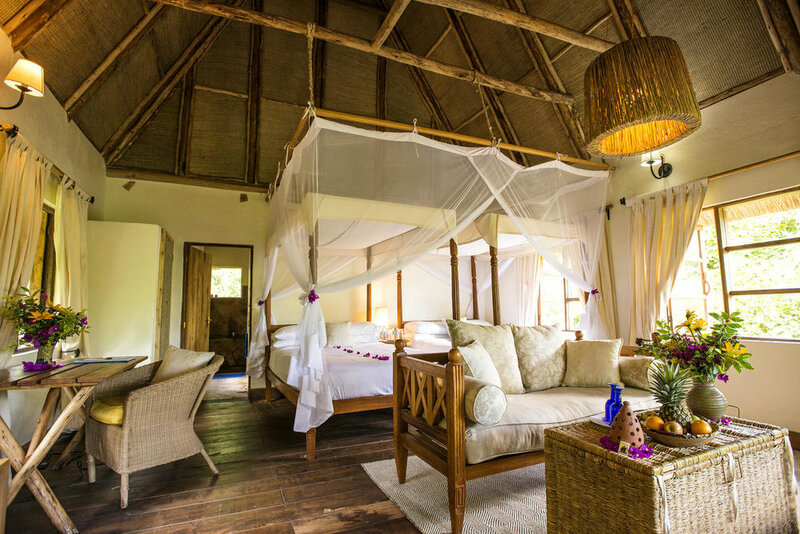 The eight individual bandas, each having their own view of the forest, have beenÂ been totally restyled with warm luxurious interiors and inviting four poster beds and locally-inspired furniture. The Forest Spa Humula mwa Ishamba was opened in April 2018. The award-winning Bwindi Bar, in the high street of the village nearby is the most stylish and colourful bar in the area! Guests also enjoy informal tapas style meals inspired by Ugandan dishes at the Award-winning Bwindi Bar, in the local high street. It’s the Harry’s Bar of Bwindi! Guests can even make their rolex wrap. The bar was set up to train disadvantaged local youngsters in hospitality. It is run byÂ Volcanoes Safaris Partnership Trust. Today’s adventure begins well before sunrise, as there is an early morning entry into a gorilla sanctuary. The rainforest is a spectacular, heavily vegetated and dense landscape crisscrossed by numerous animal trails, allowing access for trekkers. This park is best known for the fascinating gorillas, where the time taken and terrain varies according to the movements of these fantastic apes. The thrill of spending time with and observing these gentle giants is a rare and moving adventure that will leave you with long lasting memories of a truly unique experience. The gorillas are shy and peaceful animals and it is an unforgettable experience to watch and photograph them as they interact with each other. This tracking adventure takes anywhere from 3 - 10 hours. Return to the lodge in the afternoon for an evening at leisure to chat with fellow travelers or relax at the spa. Today, you will go for a short Pygmy walk - A cultural tourism activity at its best! It’s a hands-on, mind-opening adventure! You will get an insight of how the Batwa lived and hunted, learn about medicinal plants, and watch for animals and birds. You may get to share a traditional meal with the Batwa, hear ancient legends and traditional songs, and join in on a mock hunting party. You can even test your skill with a Batwa bow and arrow and participate in traditional dances. In the afternoon, visit a women’s project (Ride 4 a woman) with options to participate in basketry, weaving, making local dishes or take an escorted cycling adventure through the villages. Interact with the local communities for an insight on their cultural practices and ways of life. This will also give you an opportunity for last minute craft shopping. Enjoy your final night in Bwindi Lodge. After an early breakfast and check out, you will hit the road for Rwanda, with stops on the way for amazing views of the Volcanoes. Proceed to the border, go through customs and cross to Rwanda. Drive to Parc des Volcans with views of the great, old volcanoes towering up almost 15,000 feet, and nearly covered with rich, green rainforest. This stunning drive through rolling African landscapes takes about 6 hours. 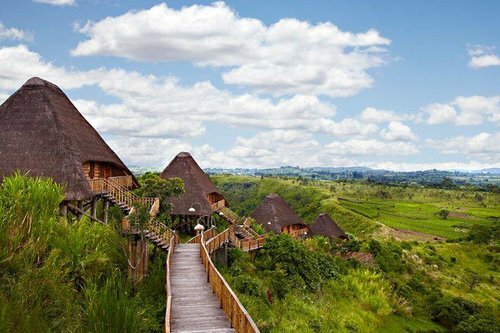 Arrive to the unique Bisate Lodge, where you will have the evening at leisure to enjoy this marvelous property and its amenities, including a guided nursery visit, indigenous tree planting and one complimentary in-room welcome massage! Get ready for another early morning transfer to the park headquarters for a briefing by the park staff. Loaded with your drinking water, packed lunch and walking stick, enter the forest in search of the famous Mountain Gorillas. The trail into the forest will abruptly immerse you in the mysterious intimacy of the thick rainforest. An exhilarating Gorilla trek through the cultivated foothills of the Virungas can be muddy and challenging but offers a truly unforgettable experience. Alive with the calls of the great apes, you will spend an hour watching them interact before sloping back to the base. As you slope through gaps in the forest canopy, the magnificent peaks, which are among the highest in Africa, can be seen. Return to the lodge later this afternoon and enjoy time to relax and reflect on all you have witnessed the past days! This morning after breakfast and a final goodbye to Bisate Lodge, start for Kigali. Should time permit, enjoy a short tour of the city which includes a visit to the genocide memorial and handicraft shops. Then head to the airport for your international flight. 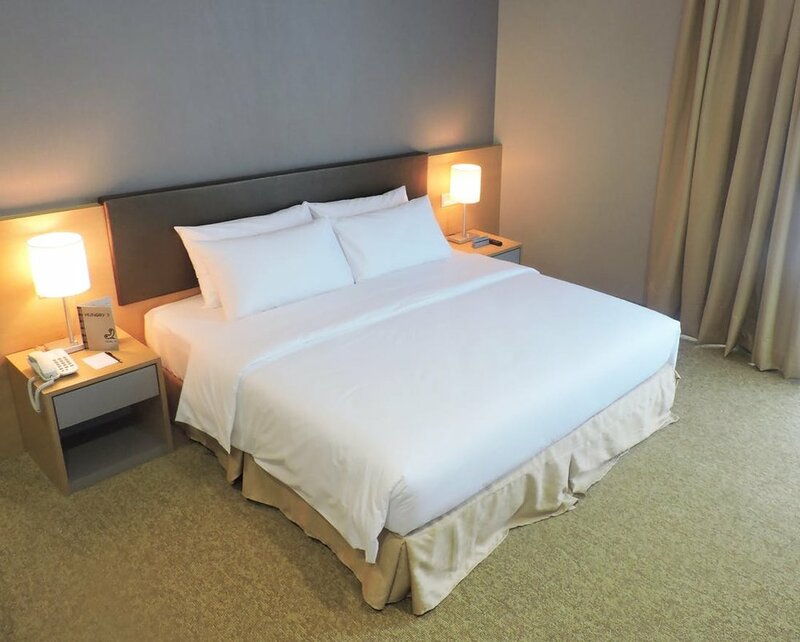 Depending on your flight schedule, you may need a day room to freshen-up before your flight (available upon payment). Please book return flights departing after 1pm.